There's a new name for Android – and what's Nintendo's big secret? It's been a funny old week, especially in the UK: all the politicians appear to have gone completely mad, and are running around like characters from Game of Thrones – and Game of Thrones just happens to be one of the shows you can watch on the brand new Now TV, which combines the best of Freeview and on-demand streaming for UK viewers. How's that for a segue? And Now TV isn't the only great thing we've seen this week. We've got a fantastic Android phone from WileyFox, some dark iPhone 7 rumours, and some scientific developments that have scared us silly – and we finally know what the next version of Android is going to be called. It's Game Of Tech! 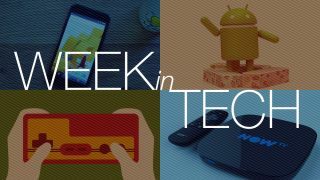 Er, Week in Tech! If you're in the UK, don't buy a TV streaming box until you've checked out the brand new Now TV Box, because Sky has given it a major upgrade. It combines Freeview content with streaming content from Sky and its partners, and as Jon Porter says, "it's hard not to love". It doesn't have the features of Sky Q or the Apple TV, but then it's an awful lot cheaper than either: at just £40, "the Now TV Smart Box looks like it could be the most affordable and polished way of bringing your 'dumb' TV into the streaming era". Nugget or noo-ga? Let the Nougat battle begin! Google has announced that the new name for Android N will be Nougat – and that's a problem, because some people, who are wrong, pronounce that word as 'noo-ga' when of course it's 'nugget', and we can only imagine the battles that'll result from this nomenclatural controversy. We much preferred the rumoured Nutella – although anyone who thought Naan was a possible needs to have a word with themselves – and we've started a poll to find out what you think of the name, and whether you've got better words than nugget. Fancy a decent Android handset for less than £100? Then the excellently named WileyFox Spark may be just what you're looking for. As John McCann explains, "a phone which sets you back less than £100 won't set the world alight, but for those looking for an inexpensive Android with a pleasing screen and a camera which isn't total garbage, the Spark may be perfect". It'll set you back just £89.99 SIM-free, and for that low, low price you get a five-inch screen, a 1.3GHz quad-core processor and a pair of 8MP cameras. If you're looking for a basic everyday phone, the Spark is great value. All aboard the tech train, destination speculation station! Nintendo's up to something, and that something is so secretive that Nintendo decided not to show it at E3 in case rivals nicked the idea. According to Nintendo's Shigeru Miyamoto, the company is working on "an idea" – and he's previously alluded to a "brand-new concept". What could he mean? Hugh Langley has several possible explanations, including VR, a whole new way of controlling the on-screen action, integration of Nintendo's Quality of Life platform or possibly a "really, super, mega powerful" new console along the lines of Microsoft's Project Scorpio. Not only that, but Langley has a sixth, secret answer that we won't spoil here. Isn't tech exciting? iPhone 7: back in black? Der! Der der der! Der der der! Dee dee dee dee dee! That's AC/DC's peerless Back In Black soundtracking the latest bunch of iPhone 7 rumours, which include the possibility of a black iPhone, possibly called 'Space Black'. That's great news for anyone with a Space Gray model who wishes their iPhone was that little bit blacker, and it fits with the colour range of the Apple Watch. The 7 is expected to be slimmer too, with no 3.5mm headphone jack and a larger camera lens. As ever, we've collated all the rumours, and sifted through them to discover which ones are most plausible.